The Karate Kid, ages 4 to 40 and up are returning to the art, the traditions, and the discipline of karate to gain knowledge that is generally not taught in the public school system. Our more mature karate kid; the Adults, are returning to the teachings of the "Martial Way" to simplify their lives... and to bring serenity in an otherwise chaotic world. Take a serious attitude. Keep a quiet mind and a restrained, courteous manner. Through a diligent practice, seek self-confidence and serenity of mind. Have patience. If you expect to learn everything in one day, in one month, or all techniques in one year, you are deceiving yourself. True skill comes only after learning, practicing, and repetition of the art. It requires mental and physical dedication from the artist. A good Martial Arts Practitioner should display polite, respectful manners at all times. 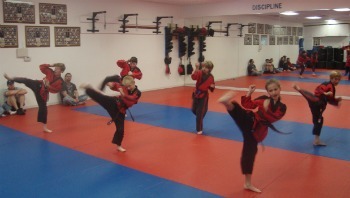 As a Martial Arts Practitioner you are responsible for their comfort. When introductions are necessary, always introduce the person with the highest rank, social position, or eldest first. Do not discuss or demonstrate the art of TaeKwon-Do outside of the Dojo, except with fellow students, family, and close friends in confidence. Nothing is gained, but much may be lost by boasting. USE MIGHT FOR RIGHT. Do not abuse your knowledge and martial arts training. Avoid confrontation. Use your training for self-defense and only when REALLY necessary. Professional Karate Center's is interested in yrou stories. And, so are our readers! What have you learned since your last belt Test? What part of karate do you like best? How has karate helped you? You are a respected Martial Artist. Pick something and share your story with your friends, family, and others. It's Not Just the Title but the Honor That Comes With It.